According to news articles, heavy rains caused landslides and flooding in the town of Verapaz, about 6 km NW of the summit of San Vicente, during 7-8 November. Mud and boulders swept down the flanks San Vicente, and in conjunction with flooded rivers, buried homes and cars; at least 144 people were killed and about 60 were missing. During 7-8 November 2009, heavy rains caused landslides and flooding in areas NE to NW of San Vicente in central El Salvador (figure 12), resulting in flooded rivers, buried homes and car, and casualties. The most recent volcanic activity consisted of lava flows that were covered by an eruption of neighboring Ilopango volcano in 260 AD. According to the USGS, previous earthquake-and rainfall-triggered landslides and lahars occurred in 1774, 1934, 1996, and 2001. In 1774, a lahar on the NE flank affected the town of San Vicente. The 1934 lahar on the N flank destroyed the town of Tepetitan, more than 6 km from the summit. In 1996, landslides and lahars on the S flank damaged the major roadway between Tecoluca (17 km NW) and Zacatecoluca (6 km SSW). On 13 February 2001, a M 6.6 earthquake caused more than 25 landslides on the N and NW flanks of the volcano that reportedly killed 39 people. However, no subsequent volcanic activity occurred from San Vicente, San Miguel, San Salvador, or Santa Ana volcanoes. Figure 12. Location map of San Vicente volcano in the Departamento of San Vicente, in El Salvador. The country is divided into 14 Departamentos; five of these were affected by the 7-8 November events. The capital is San Salvador, 40 km WNW of San Vicente. Frequent and heavy rains on 7 November 2009 and into the next morning caused landslides, lahars, and flooding in the major drainages around the northern flanks of San Vicente. Servicio Nacional de Estudios Territoriales (SNET) reported that debris flows traveled up to 7 km away, severely affecting roads and towns. Loss of life and property were particularly severe in Verapaz, population ~ 3,000, (about 6 km NW of the summit) and Guadalupe (5 km NW from the summit, on the flanks), although damage was reported in several areas, including in the capital of San Salvador, 40 km WNW. According to the Pan American Health Organization (PAHO), the rate of rainfall at San Vicente volcano was 81 mm/hour, for a total of 355 mm in a 24-hour period. Five of the 14 Departamentos were affected by events caused by the rainfall: San Vicente, La Paz, La Libertad, San Salvador, and Cuscatlán. On 9 November an eyewitness living in Verapaz noted in media reports that, "It was about two in the morning when the rain started coming down harder, and the earth started shaking... The next thing I knew I was lying among parts of the walls of my house." Another resident stated, "I started to hear roaring noises and the ground began to shake. Then my windows broke and lots of mud came in..." According to news articles, about 300 houses were flooded when a river in the town overflowed. Extensive damage was done to roads (figure 13), water and power sevices, and croplands in Verapaz. Figure 13. A resident walks through an area hit by a landslide after torrential rains in Verapaz, El Salvador, on 9 November 2009. Photo by Yuri Cortez, AFP/Getty Images. In the capital of San Salvador, eyewitnesses described an area of 8 km2 that had been covered by rocks, mud, and debris, and that many houses and hamlets had completely disappeared. At least six bridges were swept away and landslides blocked major and secondary roads, cutting communication and hindering clean-up efforts. Based on information from PAHO, the number of people in shelters peaked on 16 November at 15,090. As of 22 November, 198 people had died, 77 were missing, and 5,759 remained in shelters. The estimated number of affected people was 75,000. Information Contacts: Servicio Nacional de Estudios Territoriales (SNET), Km. 5 1/2 carretera a Santa Tecla y Calle las Mercedes, contiguo a Parque de Pelota, Edificio SNET, Apartado Postal 27, Centro de Gobierno, El Salvador 2283-2246 (URL: http://www.snet.gob.sv/); Pan American Health Organization (PAHO) - El Salvador, 73 Avenida Sur No. 135, Colonia Escalón, San Salvador, El Salvador (URL: http://devserver.paho.org/els/); Associated Press (URL: http://www.ap.org/); Los Angeles Times, 202 West 1st Street, Los Angeles, CA 90012, USA (URL: http://www.latimes.com/); BBC News (URL: http://news.bbc.co.uk/). There were reports of volcanic activity at San Vicente volcano after a M 6.6 earthquake occurred at 1422 on 13 February. The earthquake caused more than 25 landslides on the flanks of the volcano that reportedly killed 39 people. The Centro de Investigaciones Geotécnicas investigated the activity reports and determined that no volcanic activity had occurred. In addition, the government reported that there was no volcanic activity at San Miguel, San Salvador, or Santa Ana volcanoes. 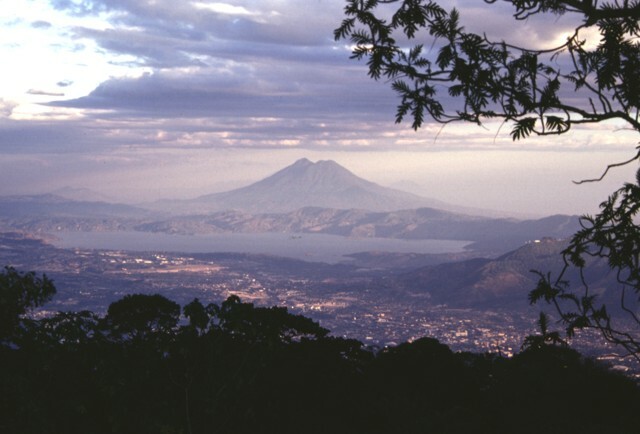 The twin peaks of San Vicente volcano, also known as Chichontepec, rise dramatically to the SE of Lake Ilopango. The modern andesitic stratovolcano was constructed within the Pleistocene La Carbonera caldera, whose rim is visible only on its SW side. 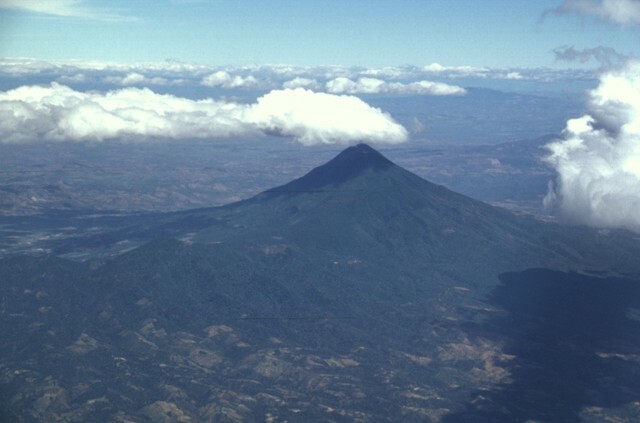 San Vicente volcano, the second highest in El Salvador, grew within the caldera to form a paired volcano with summit craters oriented along a WSW-ENE line. The northern and southern flanks are covered by lava flows from the central vent, but lava flows on the eastern side originated from a vent on the upper flank. Volcanism has continued into the Holocene, but the latest lava flows are covered by deposits from the major ca. 260 CE eruption from neighboring Ilopango. Reports of historical eruptions in 1643 and 1835 are false (Catalog of Active Volcanoes of the World; Sapper, 1917), but numerous hot springs and fumaroles are found on the northern and western flanks. Aiuppa A, Rotolo S G, Villa I M, 1999. Stratigraphy, geochemistry and geochronology of a Quaternary pyroclastic sequence of the Chichontepec volcano, El Salvador. Rev Geol Amer Central, 22: 75-86. Barberi F, Rotolo S G, Aiuppa A, 1995. Petrology of Chichontepeque volcano (El Salvador). Periodico Mineral, 64: 89-91. Escobar C D, 1999. (pers. comm.). Major J J, Schilling S P, Pullinger C R, Escobar C D, 2004. Debris-flow hazards at San Salvador, San Vicente, and San Miguel volcanoes, El Salvador. In: Rose W I, Bommer J J, Lopez D L, Carr M J, Major J J (eds), Natural Hazards in El Salvador, Geol Soc Amer Spec Pap, 375: 89-108. Major J J, Schilling S P, Pullinger C R, Escobar C D, Howell M M, 2001. Volcano-hazard zonation for San Vicente volcano, El Salvador. U S Geol Surv Open-File Rpt, 01-367: 1-21. Rotolo S G, Aiuppa A, Pullinger C R, Parello F, Tenorio-Mejia J, 1998. An introduction to San Vicente (Chichontepec) volcano, El Salvador. Rev Geol Amer Central, 21: 25-36. Rotolo S G, Castorina F, 1998. Transition from mildly-tholeiitic to calc-alkaline suite: the case of Chichontepec volcanic centre, El Salvador, Central America. J. Volcanol. Geotherm. Res., 86: 117-136. Weyl R, 1952. Estudios geologicos en la region del Rio Comalapa, El Salvador. El Salv Univ Inst Tropical Inv Cient Commun, 3: 4-7. The Global Volcanism Program is not aware of any Holocene eruptions from San Vicente. If this volcano has had large eruptions (VEI >= 4) prior to 10,000 years ago, information might be found on the San Vicente page in the LaMEVE (Large Magnitude Explosive Volcanic Eruptions) database, a part of the Volcano Global Risk Identification and Analysis Project (VOGRIPA). There is no Deformation History data available for San Vicente. There is no Emissions History data available for San Vicente. Massive San Vicente stratovolcano has twin peaks known as Las Chiches. San Vicente, seen here from the north along the Pan-American highway, has been modified by erosion, and only the poorly preserved remains of the eastern crater persist. The age of the most recent eruption of San Vicente, also known as Chichontepec, is not known. Reports of historical eruptions in 1643 and 1855 are false, but numerous hot springs and fumaroles are found on the flanks of the volcano. The summit of San Miguel volcano provides a vista down an E-W-trending volcanic chain between it and San Vicente volcano, the sharp-topped peak on the right horizon. The broad El Tigre volcano appears in the center of the photo beyond the slopes of Chinameca volcano in the right foreground. At the extreme left is Usulután, and to its left the summit of Taburete volcano is hidden behind a small cloud. Behind El Tigre are the peaks of the Tecapa volcanic complex. The Apastepeque volcanic field consists of a cluster of about two dozen lava domes, cinder cones, and explosion craters NE of San Vicente volcano, the large stratovolcano at the left. The lake-filled Laguna de Apastepeque crater is visible at the right, below Cerro Las Delicias lava dome. On the left-center horizon is Cerro Santa Rita lava dome. Lobate lava flows are seen on the northern flank of San Vicente volcano. These and other flows of San Vicente have not been dated, but all are overlain by pumice of the Tierra Blanca Joven (TBJ) formation, erupted from neighboring Ilopango caldera about 1750 years ago. Post-caldera lava flows constructing San Vicente volcano range from basaltic andesite to dacitic composition. Most satellitic vents are dacitic. Photo by Carlos Pullinger, 1994 (Servicio Nacional de Estudios Territoriales, El Salvador). 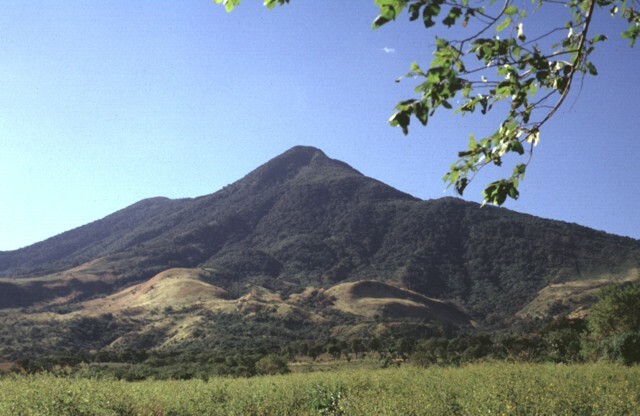 San Vicente volcano has a single sharp summit when viewed from the east. The shoulder of the SW-most peak, hidden in this view behind the eastern summit, can be seen on the left-hand flank. 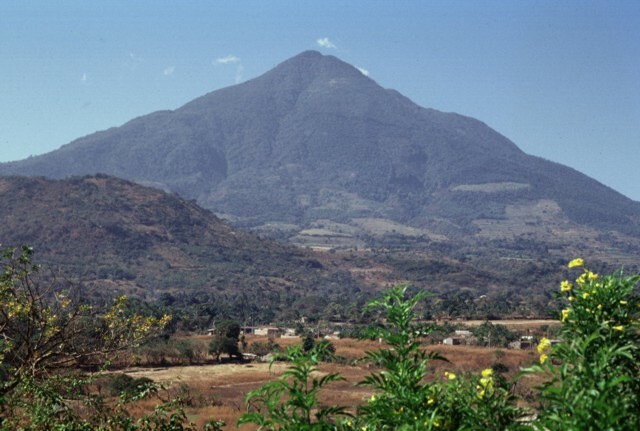 San Vicente is the 2nd most voluminous Salvadoran volcano after Santa Ana; the twin 130 cu km andesitic Chichontepec edifice was constructed within the Pleistocene La Carbonera caldera. Steaming fumaroles rise from Agua Agria, a large thermal area on the flank of San Vicente volcano. 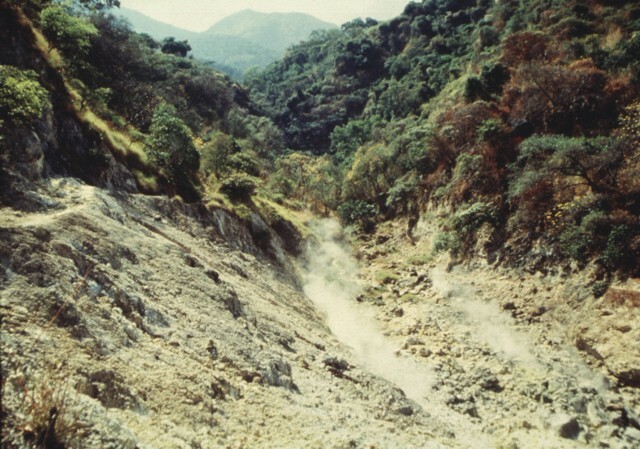 Low-temperature fumaroles (<100 degrees centigrade) and hot springs are located along faults cutting the northern and western flanks of San Vicente. Photo courtesy of Comisión Ejecutiva Hidroeléctricia del Río Lempa (CEL), 1992. 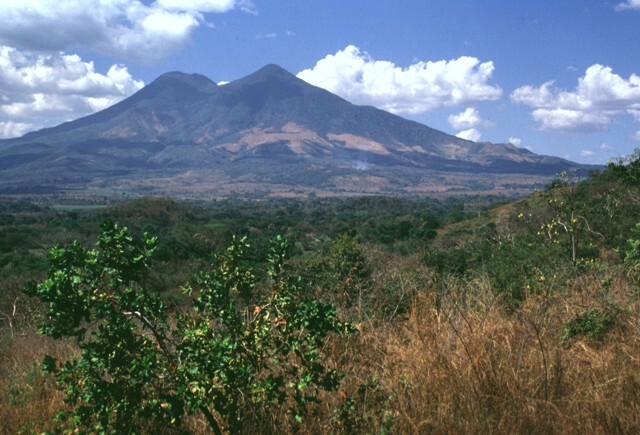 San Vicente is one of several Salvadoran volcanoes that have been the sites of geothermal exploration projects. 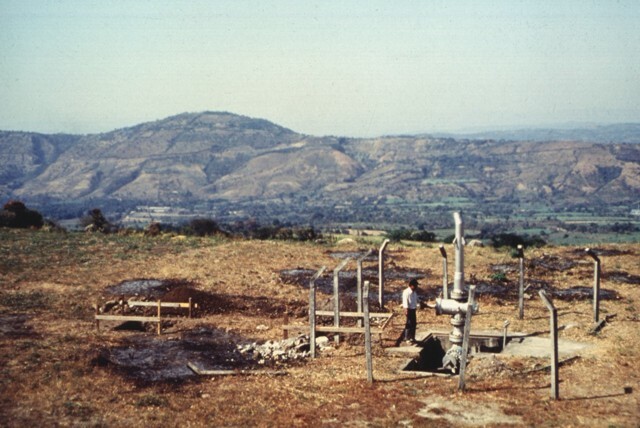 The SV-1 well in the foreground is located on the northern flank of the volcano. The low Cerro el Cerrón lava dome, part of the Apastepeque volcanic field, is located to the NE on the left horizon. The easternmost summit of San Vicente volcano (also known as Chichontepec) is seen here from the NE along the road to the city of San Vicente. The hill in the left foreground is Cerro Ramírez, a flank cone that is one of the most recent vents of the volcanic complex. Although no historical eruptions are known from San Vicente, seismicity remains relatively high, and in 1936 a seismic swarm destroyed much of the city of San Vicente. 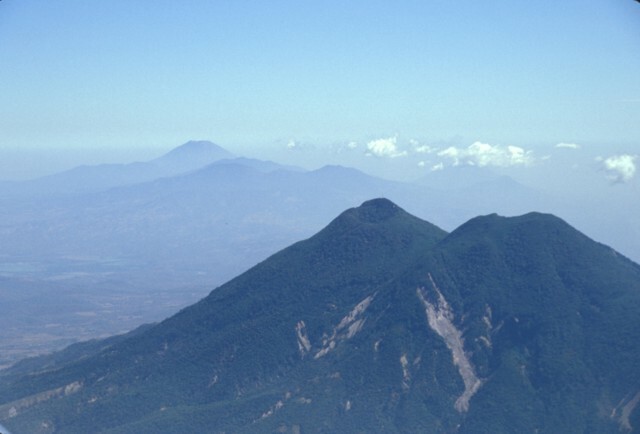 San Vicente is exceeded in height and volume only by Santa Ana among El Salvador's volcanoes. The large hill in the foreground is part of the Tecoluca debris-avalanche deposit on the SE flank of San Vicente (also known as Chichontepec), whose twin summits appear in the background. The avalanche and associated lahars traveled about 25 km to the Río Lempa. 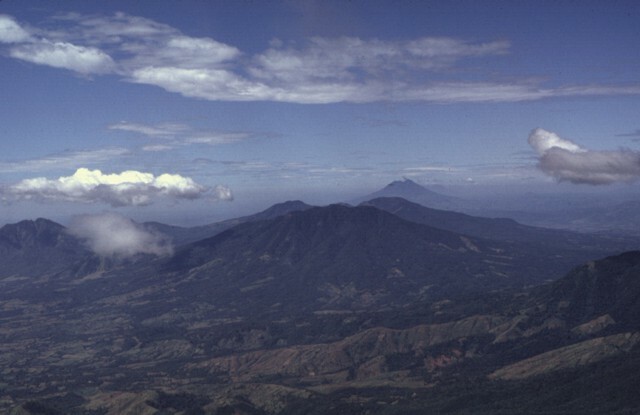 The twin summits of San Vicente volcano are prominent from the SE side of the volcano. The sharp-topped 2182-m-high eastern summit (right) is considered to be morphologically younger than the 2105-m-high western summit, although no dates have been obtained from San Vicente lava flows. 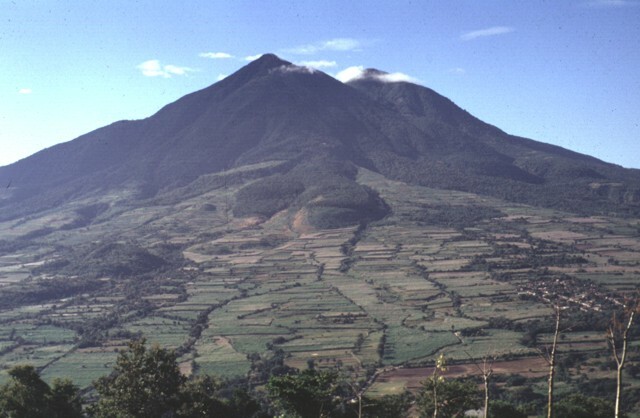 The modern San Vicente volcano was constructed by the extrusion of thick lobate lava flows that originated primarily from the summit vents and a vent on the eastern flank. San Vicente volcano, like San Miguel volcano, rises in relative isolation about 2000 m above the Pacific coastal plain of El Salvador. 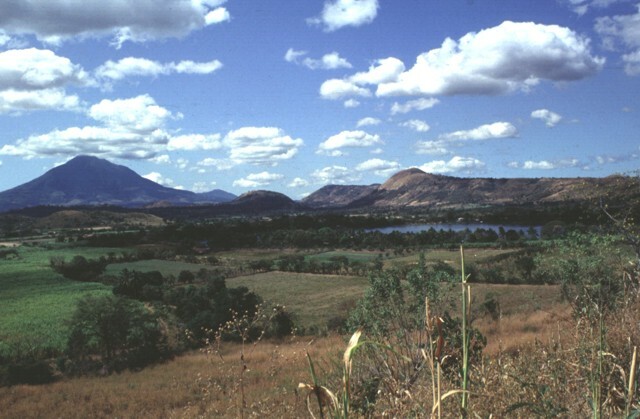 The volcano was constructed within a caldera left by collapse of the Plio-Pleistocene La Carbonera volcano, whose western flanks form the low forested hills in the left foreground. 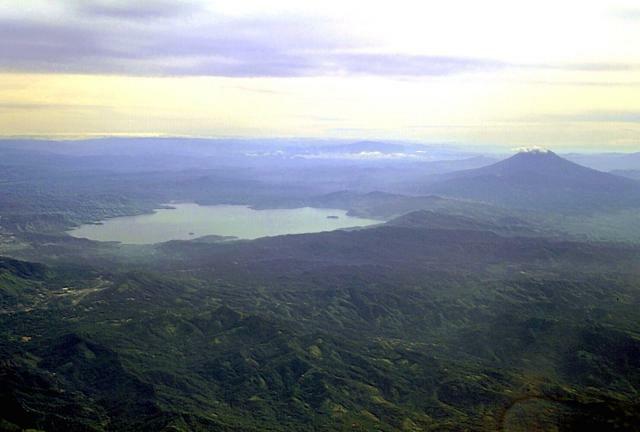 The eastern rim of the caldera has been buried by growth of San Vicente. The volcano was constructed within the 20-30 km wide Central Graben that cuts Tertiary volcanic basement rocks. 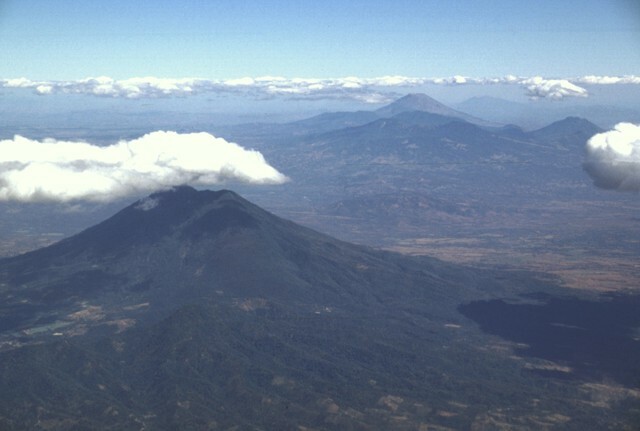 An eastward-looking aerial view down the main Salvadoran volcanic front shows San Vicente volcano below the cloud in the foreground and Tecapa, El Tigre, and Usulután volcanoes below the horizon at the upper right. The small cone in the saddle between Usulután and El Tigre is Cerro Oromontique. Behind Tecapa and El Tigre is conical San Miguel volcano, and to its right in the far distance is Conchagua volcano, the easternmost on the Salvadoran mainland. 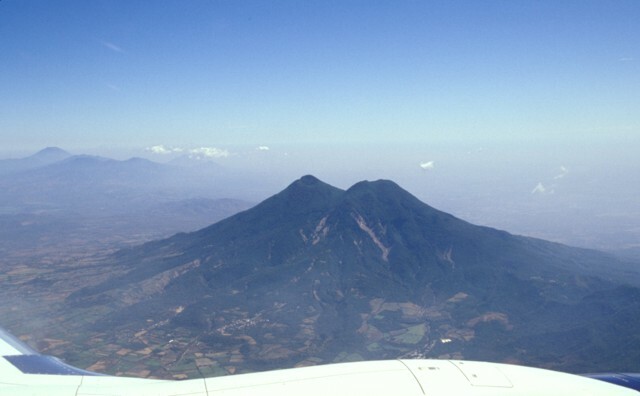 Flights from the international airport at San Salvador often pass close to San Vicente volcano, whose twin summits are seen here from the south. The low hill at the extreme right is the rim of La Carbonera caldera, which was formed as a result of a major plinian explosive eruption during the Pleistocene. 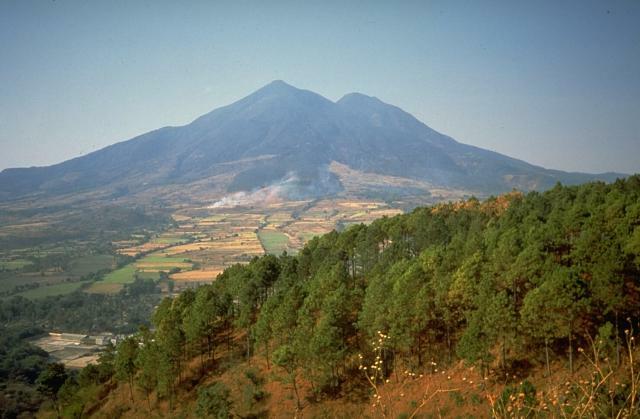 Destruction of this tholeiitic volcano about 550,000-590,000 years ago was followed by growth of the calc-alkaline San Vicente (Chichontepec) volcano. 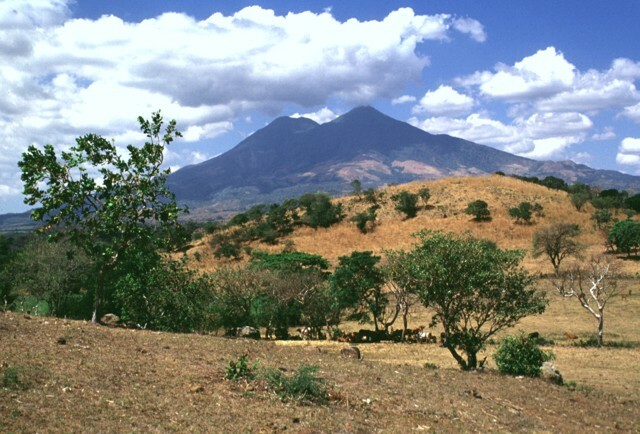 The twin summits of San Vicente volcano form one of El Salvador's most prominent natural landmarks. Fresh scarps from landslides produced during the January 2001 earthquake scar the flanks of the volcano. The San Vicente area and towns at the foot of the volcano were particularly hard hit by the tectonic earthquake and suffered extensive damage. The Tecapa volcanic complex and conical San Miguel volcano rise in the distance. There are no samples for San Vicente in the Smithsonian's NMNH Department of Mineral Sciences Rock and Ore collection. Large Eruptions of San Vicente Information about large Quaternary eruptions (VEI >= 4) is cataloged in the Large Magnitude Explosive Volcanic Eruptions (LaMEVE) database of the Volcano Global Risk Identification and Analysis Project (VOGRIPA).